NAVAL, Biliran – The long wait is over. After several years of waiting of Biliranons and other stakeholders for the primary tertiary institution of learning in the province of Biliran to attain a university status, the Senate of the 14th Congress of the Philippines finally approved on third and final reading Senate Bill No. 2146 that would pave the way for Naval Institute of Technology (NIT) to become Naval State University (NSU). Senate Bill No. 2146 entitled or “An Act Converting the Naval Institute of Technology in the Municipality of Naval, Province of Biliran into a State University to be known as the Naval State University, Integrating therewith the Biliran National Agricultural College in the Municipality of Biliran, and Appropriating Funds Therefor” was introduced by Senator Juan Miguel F. Zubiri and approved by the Senate on Third and Final reading yesterday afternoon, August 18, 2009. Senate Bill No. 2146 is sponsored by Senator Mar Roxas and co-sponsored by Senators Juan Miguel F. Zubiri and Edgardo J. Angara. House Bill No. 04414 with the same title content with Senate Bill No. 2146 was filed in the Senate during the second regular session of the 14th Congress on September 16, 2008 requesting for concurrence with Representative Glenn A. Chong as the principal author and Representatives Cynthia A. Villar, Edcel C. Lagman, Exequiel B. Javier and Jesus Crispin C. Remulla as co-authors. It was treated on First Reading and referred to the Committee(s) on Education, Arts and Culture and Finance on September 17, 2008. On July 29, 2009, SB No. 2146 was returned and submitted jointly by the Committee(s) on Education, Arts and Culture and Finance per Committee Report No. 543, recommending its approval with amendments. On August 11, 2009, the Committee Report was calendared for Ordinary Business with Senators Mar Roxas, Juan Miguel F. Zubiri and Edagrdo J. Angara as sponsors and at the same time was assigned for Consideration by Special Orders. On the same day, Senator Mar Roxas delivered his sponsorship speech, the period of interpellation was closed, the period of committee and individual amendments was done and closed. It is also during that day that it was approved on Second Reading with Amendments were all senators who were present were made as co-sponsors. On August 12, 2009, copy of Senate Bill No. 2146 were printed and distributed to the senators and on August 18, 2009 it was approved on Third Reading. Senate Bill No. 2146 is up for signature of President Gloria Macapagal-Arroyo after it will be submitted to the House of Representatives for adoption. Meanwhile, Representative Glenn A. Chong who first filed House Bill No. 04414 on June 16, 2008 in the House of Representatives of the 14th Congress of the Philippines, informed PIA about the latest news last Tuesday afternoon thru his mobile phone. Rep. Chong revealed that it took three months for HB No. 04414 before it was finally transmitted and received in the Senate on September 16, 2008. HB No. 04414 which substituted HB No. 01927 was approved on First Reading in the House of Representatives on July 29, 2008, approved on Second Reading on August 12, 2008 and was approved on Third and Final Reading on September 9, 2008 with House votes of 193 for Yes and 0 vote for No and Abstain. Rep Chong said that this is a significant development for the Lone Congressional District of Biliran he represented since he believed that education is a great equalizer. The young solon who is on his first term informed that education is one of his top priorities aside from health and infrastructure development. “I can promise nothing to the Biliranons who are my masters except an honest public service which would redound to the progress and development of Biliran province as a whole”, Rep Chong said. TACLOBAN CITY – The excellent performance and unprecedented accomplishments of the Technical Education and Skills Development Authority (TESDA) Biliran Provincial Office in 2008, have won for it back to back awards both in the regional and national level. Director Loreta D. Banario informed that having satisfactory rating in physical accomplishment such as training inputs, competency assessment and employment rate and financial aspect, TESDA-Biliran received awards as 3rd Best TESDA Provincial Office in Region 8 and 2nd Top Performing TESDA Provincial Office nationwide for the year 2008. On June 25, 2009, Dir. Loreta D. Banario received the plaque of recognition from Dir. Juan M. Sabulao, Jr., TESDA Regional Director, stating TESDA-Biliran as one of the Best TESDA Provincial Offices in region 8. Anent to this, TESDA-Biliran was also recognized as the 2nd Top Performing Provincial Office in the region way back on the year 2007. Furthermore, TESDA-Biliran also received another award as 2nd Top Performing TESDA Provincial Office Nationwide. This award recognized TESDA-Biliran as one of the outstanding TESDA-Provincial Offices throughout the Philippines. These recognition will serve as an encouragement and inspiration to TESDA-Biliran officials and staff to continue their effort in implementing relevant programs and services for Biliranons. CALBAYOG CITY, Samar – In year 2010 or 17 months from now, the whole island of Samar will no longer experience frequent power interruption and regular “black outs” that apparently hinders the economic growth of this island. This was announced through a media presentation made by Ms. Belinda S. Canlas, Corporate Communications Officer for the Visayas; Edna Legaspina, Corporate Communications Officer A; Engr. Mercurion Palamos, OIC Wright-Calbayog Project; Engr. Ruben Almaden, Site Management; and Line Engineer Artemio Jabaan, District 1 Leyte-Samar Area, all officials of the National Grid Corporations of the Philippines (NGCP) who attended the Samar Island Press Club (SIPC) Annual Assembly held on August 15 in this city. Equipped with their technical expertise, these officials came together and explained that the National Transmission Corporation (Transco), last June 30, 2009, was turned into a private entity – the NGCP, which eventually took over the crucial task of delivering safe and reliable electricity throughout the country. Incorporated in 2008, the NGCP is a consortium composed of Monte Oro Grid Resources Corporation (MOGRC), State Grid Corporation of China (SGCC) and Calaca High Power Corporation (CHPC). Offering a bid of US$3.95 billion, the consortium won in the bidding for the franchise (for 50 years) to operate and maintain the country’s transmission network – the biggest government auction conducted in efforts to reform the local power sector. In their Project Vista, or the Visayas Transmission Augmentation Program, Ms. Canlas informed that the NGCP sealed-off an amount of P1,638,597,922 for two major transmission lines projects in Samar Island alone. “This is anchored on the mandate and functions of the Transco as clearly defined by the RA 9136 otherwise known as the Electric Power Industry Reform Act of 2001,” Ms. Canlas said. The lady official identified the first project in Samar as the Wright-Calbayog 138kv Transmission Lines Project with a total project cost amounting to P1,188,806,922 from Transco’s Internal Cash Generation. They intend to finish the project on or before September 2010. As of today, the power transmission to Northern Samar is still through the 69 KV wood pole lines which is susceptible to frequent power interruption and (because of its being) under voltage. With this, electric consumers apparently got irked to the unscheduled ‘blackouts’ that even lasted to three straight days. The power users lambasted the local electric cooperatives that likewise passed the blame to the Transco, now the NGCP, who supply electricity to them. With this development project, “power users in Northern Samar and nearby towns will benefit from quality and stable power supply, which will serve as catalyst to jumpstart their economic progress which (has) been hampered through the years, primarily due to underdeveloped basic infrastructures including electricity,” Engr. Palamos stressed. This project, which will benefit the towns of Paranas, Motiong. Jiabong, Catbalogan, Tarangnan, San Jorge, Gandara, Sta. Margarita and Calbayog City is likewise considered as ”the commitment of Transco to comply with the requirements set by the National Grid Code as promulgated by the Energy Regulatory Commission (ERC),” NGCP officials said. The second project of the NGCP is the 69 KV transmission lines from Sta. Rita Samar to Quinapondan Eastern Samar (103 kilometers). The primary purpose of this project is to “accommodate the load growth and demand, address problem of voltage quality and improve system reliability in Eastern Samar,” NGCP officials said. The estimated total cost of this project is P230.517M plus US$4.217M or a total of P449.791 million. Ms. Legaspina said that though the project has been approved by the ERC, it is now being proposed that it will be upgraded into 138 KV. “We are now forwarding again this suggestion for ERC’s comments and hopefully approval, that this supposedly 69 KV will become 138 KV and be included in our 3rd Regulatory Period or in year 2010-2015,” she said. It was learned that the new NGCP organization brings with it a new goal to upgrade and expand all transmission facilities in the countryside, which in turn enhance the lives of all their electric customers. “For sure, they (clients) will be rewarded with energy cost savings, the investors to be provided with fair return, and the society to enjoy an environmental-friendly energy system,” the NGCP officials disclosed. TACLOBAN CITY – The province of Leyte is all set to welcome the Vice-Governors from the different provinces of the Philippines who will be arriving on August 20 for the National Assembly of the Vice Governors League of the Philippines. Leyte Vice-Governor Mimyet Bagulaya who is the National Treasurer of the League, informed the Philippine Information Agency, that the national assembly is scheduled to be conducted at the Leyte Park Hotel in Tacloban City on August 20 to 22. Leading the participants are Vice Governor Julius Cesar Herrera of Bohol who is the President of the League and Ilocos Sur Vice Governor Jeremias Singzon who is the Chairman of the Board. The assembly will tackle the issues of Climate Change, as a Science and in the creation of policies; and the 2010 Election Automation, Vice Governor Bagulaya said. The province of Leyte has always welcomed visitors who are attending conventions or assemblies because Governor Petilla believes that these are good opportunities to promote the province of Leyte and the entire Eastern Visayas Region as well. Governor Petilla and the officials of the Province of Leyte has prepared for a simple but memorable Welcome Dinner at the Governors’ Hall of the Capitol. Before Dinner however, the guest will have a tour at the Caluayan Palm Resort and at the Raphael’s Farm, in Marabut, Samar and Babatngon, Leyte, respectively. Thus, the visitors will also have the chance to visit Southern Leyte where Agas-Agas Viaduct, the tallest bridge in the country today, is located. This is courtesy of Vice-Governor Maamo and Governor Mercado, the good vice governor of Leyte disclosed. Vice Governor Bagulaya added that on the third day of the Assembly, the group will be able to follow the trails of President Gloria Macapagal-Arroyo who recently visited Sohoton Bridge and had a Golden River Cruise in Basey, Samar. The Vice Governors League of the Philippines has the primary purpose of ventilating, articulating, and crystallizing issues affecting provincial government administration specially those concerning local legislation and securing, through proper and legal means, solutions thereto. The League also assists the national government in the formulation and implementation of policies, programs and projects affecting the provinces a whole; promote and give meaning to local autonomy and decentralization; foster unity and cooperation among all Vice Governors in the country in particular and all provinces in general. The League also provides a unified and a cohesive force that will embody the sentiments and aspirations of the members; encourage people’s participation in local government legislation and administration in order to promote united and concerted action for the attainment of countrywide development goals; and serves as a forum of discussion and feed back mechanism on policies affecting local governments particularly in the area of local legislation. TACLOBAN CITY – PNP Chief and Director General Jesus A. Verzosa, during his interaction with the local media, expressed optimism that the Commission on Elections will approve the proposal made by the Philippine National Police, for Total Gun Ban for the 2010 elections. The proposal was made with the hope of putting a stop to election-related violence, General Verzosa said. He said that there would be no exemptions in the proposed gun ban, duty policemen and security escorts in proper uniform would only be the ones allowed to carry guns, the PNP Chief underscored. It is a fact that there is always a prevalence of violence during election period especially in the election hot spots, and there were incidents in the past where two candidates who are vying for the same position sometimes meet and get violent, the chief PNP added. The PNP proposal would cover everyone, including government officials and private individuals and their security escorts. “One of the provisions of this proposal is for all security personnel to be in their uniform so that there will be no need for a gun ban exemption. Para ma-identify natin sila na [So we can identify that] they are security,” he said. “Even protective agents, under the jurisdiction of SAGSD (Security Agencies and Guards Supervision Division), they are required to be in proper uniform, which they are trying to come up right now,” General Verzosa added. Furthermore, the PNP Chief said that the PNP would not allow the existence of private armies of politicians, particularly in the provinces. “We will not allow private armies in the next elections. That’s one thing people should be very convinced about,” said the PNP Chief. General Versoza said the removal of violence is the next important thing in the polls after the automation of elections. The PNP recorded 217 election-related violent incidents (ERVIs) during the May 2007 elections. Only 72 incidents have been validated as politically motivated cases, while 82 incidents turned out to be personally motivated and 63 cases remain under investigation. 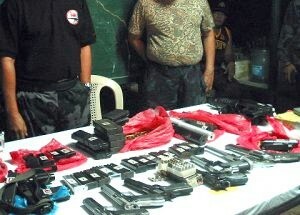 The PNP arrested 2,314 people for violating the Comelec-imposed gun ban and seized almost 2,000 guns nationwide. BORONGAN, Eastern Samar – Borongan’s ambulant vendors are now in a hot seat following the complaint raised by licensed vendors inside the public market. A fish vendor who is popularly known as “Ben-ben” called over Radyo ng Bayan DYES to lodge his complaint over the long line of fish vendors which teem along the road leading to Borongan Public Market which is approximately 300-meters away. True enough, working mothers opt to pass by the old market site before she goes home after the day’s work where she could have a wide array of choices for dinner, from poultry to fish, instant fried chicken wings or breasts, sea-weeds to a variety of vegetables piled on top of carts. “Dire na lugod kami napapalitan didi ha merkado kay it mamaralit yadto naman la ha Sawang panmamalit hit isda ug utanon. Kami didi nalukat hin lisensiya, samtang it hira wara man, mag-uunan-o naman la kami didi?” claimed Ben-ben. (We, inside the public market who comply with business permit are deprived by these unlicensed vendors because consumers opt to buy fish and vegetables from them as they are located near downtown). Asked what could be the action of the local government, Mrs. Gloria Aboy, Market Supervisor quickly promised to bring the matter to proper authorities but Mr. Toto Bebita, another Market Supervisor has another better option in mind. According to him a strong coordination with the local police would be the better thing to do. “Perhaps, a simple police visibility in the area could spell a difference, so that, consumers who tend to flock the old market site for food will go direct to the market where vendors have been helping to increase the revenue of the Borongan LGU,” Toto stressed. The Market Supervisors mentioned together with Ms. Tonette Candido were heard on air over the government radio station as part of the monthly program of the Borongan City Consumers Association Council (BCCAC). TACLOBAN CITY – In line with the PNP’s drive against loose firearms, the Philippine National Police in Region 8 has already recovered around 65 unlicensed or loose firearms. Police Regional Office 8 Director Mario Sandiego presented the recovered firearms to PNP Chief Jesus Versoza during the Press Conference held at the VIP Lounge of the Tacloban Airport late in the afternoon of August 13. The said undertaking is under the Operation Bakal which is part of the National Firearms Amnesty program, Director Sandiego said. PNP Chief Verzosa lauded the PNP Region 8 officials and men for this job well done saying that civilians or personnel with unregistered or unlicensed firearms must surrender them to the police station nearest them or they may go directly to the regional office of the PNP so that said firearms could be accounted for. Director San Diego said that ten search warrants have been searched by the PNP 8; nine checkpoints have been set all over the Region; and 54 firearms have been recovered from civilians, 29 of which are high-powered while the remaining 36 are low –powered. In implementing this program, the Philippine National Police aims to minimize the number of election-related violent incidents. It also aims to control the proliferation of unlicensed firearms which at present, has an estimated 400, 000 loose firearms nationwide. Statistics shows that there are around one million loose firearms throughout the country. He said that of these around one million loose firearms are in the hands of civilians, many of which are being used in the commission of crimes. Of the registered gun-related incidence, 97.7 percent was committed through the use of loose firearms and the remaining 2.3 percent were made through the use of registered firearms. General Verzosa told the local newsmen that of the estimated one million loose firearms all over the country, about half were those classified as unre-registered or those with expired license which the owners of the guns failed to renew or did not register anymore. Of the remaining 50 percent of the one million, around 80 to 90 percent are those belonging to civilians which are being kept by them in their homes. The other 20 to 30 percent, he said, are distributed to the New People’s Army and members of the communist party, the terrorists, the Muslim secessionists and organized and criminal elements. He said that based on statistics, the violent crimes all over the Philippines are undertaken through the use of firearms, thus the need for the PNP to address the proliferation of loose firearms. The World Health Organization ranked the Philippines as number 10 internationally among countries having the highest number of gun-related homicides. He also said that statistics showed that most of the election-related incidences were also committed with the use of firearms, most of which are loose or illegal. The PNP is for putting stiffer penalties for gun possession to curb violations. At present, General Verzosa said, even if a person is caught with a truckload of firearms, he can still post bail under the present firearms law if he has the money to post bail for each count of loose firearms. In the same manner that if he person is caught with a canon or howitzer, he still can post bail under the present law. This makes the issue of unlicensed and loose firearms very urgent, especially because of the national and local elections next year, Verzosa added. LOS ANGELES, California – Team Concepcion is back here a day after Bernabe Concepcion blew away a chance to wrest the World Boxing Organization (WBO) featherweight diadem from champion Steve Luevano with a dismal seventh-round disqualification loss August 15 at the Hard Rock Hotel and Casino in Las Vegas, Nevada. “Hindi ko narinig. Nagulat na lang ako ng mag declare ang referee na panalo sia by disqualification (I didn’t hear the bell. I was surprised when the referee declared him winner by disqualification),” confessed the 21-year-old speedster from Virac, Catanduanes who impaired to 28 wins (16 knockouts) and three defeats. Top Rank chief Bob Arum said there will be a rematch in December “at gagawin ko ang lahat para makuha ang korona at wala nang foul blow na mangyayari (and I will do my best to capture the crown and there will be no foul blow, this time),” said Concepcion, whose failed title bid against the 28-year-old Luevano, was his fifth appearance in Las Vegas. Concepcion, who is partly managed by Manny Pacquiao, was trailing in two of the three scorecards, 67-64 (Luevano), 68-65 (Luevano), 66-67 (Concepcion) when round seven expired. Before the illegal punch was unloaded, Luevano (37-1, 15 KO’s) wobbled Concepcion with accurate rights and jabs. The five feet and seven inches tall southpaw from La Puente, California had secured the last four rounds after faltering in rounds one and two. Concepcion, who fights for Aljoe Jaro stable in Binangonan, Rizal in the Philippines, was impressive in the first two rounds peppering the taller champion with hooks and effective shots to the body. The five feet and four inches tall challenger digged into Luevano’s breadbasket and protected his slight lead in the second canto with crisp body shots. There was initial confusion when referee Jay Nady raised Luevano’s hand after the disqualification as Concepcion’s cornermen leaped in frustration but simmered down after being chided by Nady whose verdict was upheld by the Nevada State Athletic Commission which supervised the duel along with the WBO. “It was not intentional but it was a good call,” admitted Concepcion’s trainer Freddie Roach. Concepcion is being groomed as “the next Manny Pacquiao” and was once lined up to challenge Puerto Rican phenom Juan Manuel Lopez underneath the Pacquiao-Oscar De La Hoya tussle on December 5, 2008. His manager, Aljoe Jaro, however, rejected the “last-minute” invitation as Concepcion was moving up to the 128-lb category. Jaro, who co-manages Concepcion, has predicted that his ward would become world champion before reaching 25. The loss was overshadowed by Nonito Donaire’s 12-round unanimous decision victory over Rafael Concepcion for the World Boxing Association (WBA) interim super flyweight championship. TACLOBAN CITY – Warmly welcomed by the local government unit of Basey and other sectors from the province of Samar, President Gloria Macapagal-Arroyo was also happily received by Department of Environment and Natural Resources’ Protected Area Office staff as the President and her party visited the Sohoton Caves and Natural Bridge on August 9, 2009. 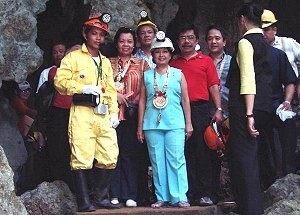 Regional Technical Director Ricardo Tomol of the DENR’s Protected Areas Wildlife and Coastal Zone Management Service, who personally joined the welcoming group for the President, said it was the first time that a President of the Philippines visited the Sohoton Caves and Natural Bridge (SCNB). Geologist of the Mines and Geosciences Bureau, Alfred Ryan Vilches, briefed the President on the geologic aspects of the cave. After President Arroyo’s spelunking activity, she was treated to a river cruise along the Golden River in Marabut and Basey, Samar. While on cruise, Basey Mayor Wilfredo Estorninos conducted a briefing on the historical facts of the SCNB and development projects provided by the President to the town of Basey. The SCNB is a proclaimed protected area (PA) per Presidential Proclamation No. 831 primarily to preserve its geological features. The said PA is now within the coverage of the Samar Island Natural Park (SINP), a protected area established per Presidential Proclamation No. 442 dated August 13, 2003 by President Arroyo herself. DENR Regional Executive Director Regidor M. De Leon disclosed that under the National Protected Areas System (NIPAS) Law (R.A. No. 7586, 1992), the SCNB as a protected area is placed under the administration and management of the DENR. The DENR is being assisted by a multi sectoral Protected Area Management Board as the planning and decision making body which is chaired by the DENR. “With the magnificent features of the caves and natural bridge and the pristine condition of the Golden River, serving as access to the SCNB, ecotourism activity is fast developing. In the course of this development, however, environmental values should never be outweighed by the economic benefits that will be derived from ecotourism operation. As Chairman of the PAMB, the DENR should ensure that ecotourism activities should at all times be consistent with the protected areas’ general management plan”, RED De Leon said. The 840 hectares SCNB is located in Barangays Inumtan and Mabini in Basey, Samar. It could be reached thru jeepneys from Tacloban to Basey. From the town of Basey, motorized boats are available. Cruising time to the SCNB is approximately an hour and a half via Basey-Marabut Golden River. In her visit, President Arroyo officially launched SCNB as a prime tourist destination. She ordered immediate completion of the road to serve as an alternate access to the area. She also ordered to put in place communication and transportation infrastructure to spur the tourism activities in the SCNB. SCNB is listed as one of the Key Ecotourism Sites in the Philippines. It is ideal for eco-adventures like caving, spelunking, kayaking and other tour packages operated by the local peoples’ organization. QUEZON CITY – The Alliance For Nationalism And Democracy (ANAD) Partylist calls on government to be extra cautious in the conduct of the forthcoming peace talks with the Maoist communist-terrorist CPP-NPA-NDF even as it strongly condemns the latter’s continued deception and lies against the Filipino people. ANAD stands committed to the use of available peaceful and equitable means in resolving any and all conflict. “However, this must be anchored on the sincerity, transparency, and real commitments of both parties,” said Rep. Jun Alcover of ANAD Partylist as he chided the Maoist communist CPP-NPA-NDF for putting up a lame-duck chief negotiator who cannot decide for and in behalf of their organizations in terms of truly implementing cessation of hostilities, open declaration of actual and real members of their panel, consultants, and staff, and others. ANAD calls on the government to challenge the NDF chief negotiator, Luis Jalandoni to bare out on his authority in leading the communist-terrorist panel. “Government must ask Jalandoni as to what authority does he bring to the negotiating table? Who appointed him as the lead negotiator when communist-terrorist CPP Chairman and Maoist messiah Jose Ma. Sison acknowledged his being a mere NDF Consultant,” said Rep. Alcover as he reiterated his earlier pronouncement that currently government is dealing with a phantom organization whose leaders do not admit or continually hide in the limbo of oblivion. In the more than 20 years of peace talks, the military and police forces were restrained from conducting offensive operations, throughout the country, during the duration of the talks. Yet, the Maoist communist NPA continuously unleashed their brutal and treacherous ways against military and police installations, private and business facilities, and innocent civilians. “This is aside from using the ceasefire to consolidate their forces, replenish its supplies, and strengthening its extortion activities. What happened was - - talk-talk-talk abroad, and at the same time, kill-kill-kill by the NPA, inside the country,” Alcover explained. “Factual developments of the previous negotiations showed that government was talking peace with a phantom organization represented by the lame-duck negotiator, Luis Jalandoni,” Alcover said. On the other hand, government should be forthright in its quest to resolve the 40 years insurgency problem with the Maoist communist-terrorist CPP-NPA-NDF. One should not be complacent when dealing with groups or individuals who have already exhibited mastery in the art of deception and lies. Deception is pronounced when they profess of not being involved in the Maoist communist organization, when arrested; but immediately identified by their leadership as member, consultant, and staff of the communist panel in the peace negotiations. Such is the case of Alfredo Mapano and Elizabeth Principe. “Indeed what a glaring deception in the highest order,” said Cong. Alcover. “Government must be wary about this repeated intentional display of astuteness by the CPP-NPA-NDF,” he added. Meanwhile, ANAD calls on the government to be circumspect and transparent on important communist-terrorism/insurgency issues. “What happened to President Macapagal-Arroyo’s all-out-war against the Maoist CPP-NPA-NDF with a 1 billion pesos budget? Has government changed its policy of no-negotiation with any and all terrorist groups or individuals?” Alcover asked. These are important questions that need to be appropriately responded to clear the doubts and suspicions of Filipinos clouding the resumption of the oftenly suspended peace talks. Alcover urged government to rectify the previous imperfections in dealing with the wily Maoist communist-terrorist CPP-NPA-NDF.